Little did you know, O Lowly Styrofoam Packing Piece, when you were formed to cradle and cushion a halogen lamp, that upon unpacking, you would be called to serve a higher purpose! How could you have dreamed that once revealed and emptied of your precious cargo, you might fall into the hands of a small girl in need. And there was no greater need in those days, than the need for a most excellent base. What are action figures without the shelter of a base? Without wall behind which they might hunker and defend themselves from marauding jungle animals three times their size? Without pressure and vacuum formed rises and dips to be seated upon as improvised couches? Without the canvas of styrofoam upon which computer terminals and monitors might be drawn, to spy upon thine enemies and receive communiques? 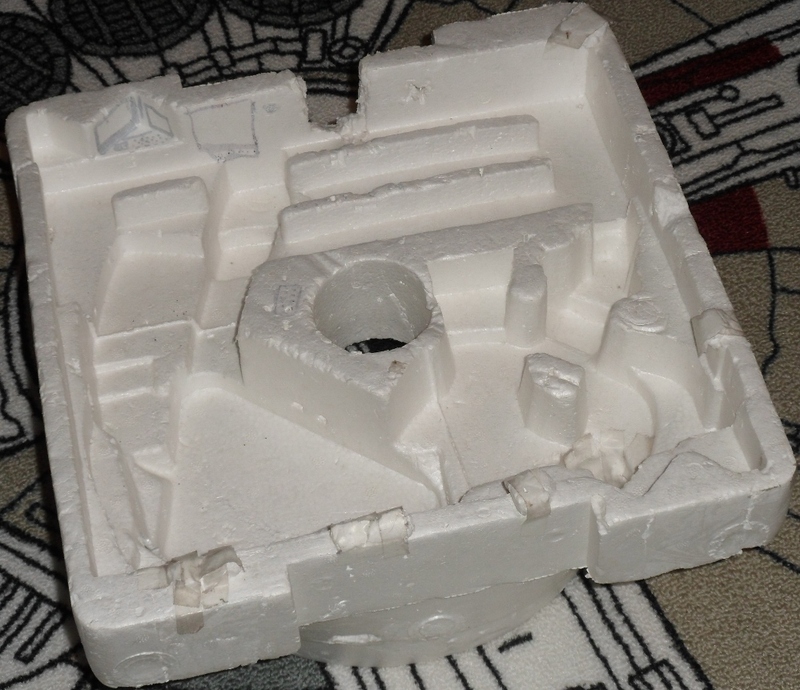 O Lowly Styrofoam Packing Piece, how finely you served! With a hole in the center, perfectly created to imprison and punish our enemies, and neat rows to prop those figures which could not quite stand on their own feet, or to be treated as benches in a make-shift briefing. Your thin corners easily broke to become escape hatches, at just the right height and size for the tiger figurine allies to stick their heads inside and converse with our heroes. Truly, there was no awesomer Base to be had. And so many hours we spent together, in play! Somehow, you survived the garbage bag sweeps in which so many green plastic berry pint elevator/prison cells lost their lives, and we played on through the years, traveled on from the house of our childhood, to the home of our teen years, and even hid those long years while I was away at college, until you returned to me again, here, now. But alas, there are no games left to play, O Lowly Styrofoam Packing Piece. Your destiny has been fulfilled, and after all these long years, it is time to set you free. To free myself from the clutter of your presence in the back of my closet where you merely waste away, beginning at long last to disintegrate, suffering only neglect, as my play has become words on pages and pages bound into books. And so I say goodbye, friend Styrofoam Packing Piece. Goodbye, and thank you for all the good times, all the memories, all the stories we shared. May you return to the great Styrofoam farm in the sky, where the children never grow up, and the action figures always need a base. They will find no greater base than you! Lovely. The simple things in life are the best.